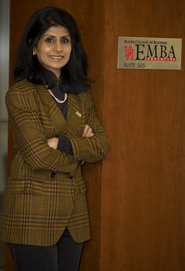 EMBA program offers flexibility says Associate Dean of Graduate and Professional Programs Latha Ramchand. In its 30th year, the Executive MBA program at the UH C. T. Bauer College of Business has been basking in compliments that reflect its longtime role in turning out well-rounded executives here in Houston and beyond. Admissions grew by 20 percent this year, says Dr. Latha Ramchand, Associate Dean of Graduate and Professional Programs at Bauer. But despite that success, EMBA has focused on being reflective about ways to grow and improve, rather than risking complacency about its place in the highly competitive world of MBA education. “We have what it takes – Ivy League smarts without the Ivy League attitude – so I don’t see why we can’t take our program to the next level,” Ramchand says. The Bauer EMBA has graduated over 1,600 students since its inception and is designed to train business leaders so that they are equipped with a real world and global perspective. That the program does indeed prepare students for leadership has been reinforced by high-profile alumni and the cohort of more than 70 students in the Global Energy Executive MBA program in Beijing. Bauer currently has over 100 alumni in China who hold key positions in the largest energy companies in the world, and it’s a sign of the strength of the Bauer EMBA’s reputation that many of those students received promotions before they even graduated, Ramchand says. 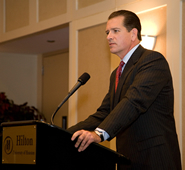 Dynegy CEO Bruce Williamson is one of numerous success stories from the program. Current students tell Ramchand there are numerous aspects of the EMBA that set it apart from other comparable programs. For GEMBA student Veronica Graham, a candidate for graduation this spring, the focus on global energy, especially oil and gas, was one of the things that made the program attractive. Graham, a senior business analyst with Murphy Exploration and Production Co., says the program has been rigorous but key to her being promoted to her current position. Graham, who has more than 10 years professional experience in the oilfield business, earned an undergraduate degree in chemical engineering in Chile and Ecuador and has a Project Management Professional certification. She has appreciated learning from fellow students who, like her, have spent several years in the workplace. Graham also likes that professors are demanding but accommodating to students’ job-based needs. They are always willing to discuss real-life cases that students encounter in their workplaces. “Professors are very experienced, but at the same time very flexible,” she says. Potential candidates for the program are often surprised to be contacted directly by administrators. “They’re not just a number,” Ramchand says. Flexible programs and the promise of assistance should problems or complications arise, also helps convince busy students to commit to the program. Management Professor Andrew “Skip” Szilagyi, who has watched EMBA evolve since its inception, says its location on a college campus, rather than in an office building or hotel conference room, offers students more services and networking opportunities than they might receive from other programs. Compared to the early days when corporations dominated executive MBA classes with their employees, classes now include many more entrepreneurs and managers from non-profit organizations, especially those related to the health care industry, Szilagyi says. Focused on the current needs of students, Ramchand is working with faculty and businesses to revamp the curriculum to include hot topics like succession planning. She and others within the department have also worked to increase lines of communication with both students and businesses. She says she is particularly impressed by the relationships and networking that develop — between faculty, advisers and students. Despite the rigors of their classes and demands of their schedules, the strength of these bonds “tells you that what we’re doing here is not just grades and career,” Ramchand says. About 150 people attended a celebration of EMBA’s anniversary in February at the UH Alumni Center. Dr. Barton Smith was the keynote speaker. He is a Professor of Economics, Director of the Institute for Regional Forecasting, and Senior Economist, Center for Public Policy at the University of Houston. Dr. Smith’s areas of expertise include urban economics and Houston Region economics and real estate.